The next morning, we were on a timetable of having to get back to San Francisco by noon. We continued south on Highway 1 to the Stewarts Point/Skaggs Springs Rd turnoff. 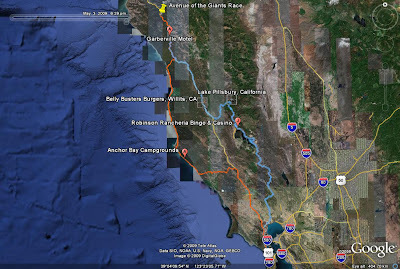 From the map, it would take us across to 101 right around Lake Sonoma and Cloverdale. Across from the turn, we saw a group of four or five guys on rented 1200gs’s from Dubbelju in San Francisco. We pulled in to say hello and found out they were visiting from somewhere in the southeast and planned to explore the coast and mountains over the next couple days. They had just come across on Stewart’s Point/Skaggs Springs Road and said it was great. We offered some tips based on where we’d just been and wished them a good trip before heading up the single lane turnoff. The road remained one lane for quite a while, climbing up from the coast to a little group of houses and a school before intermittently adding a lane. By the second half of the 41 mile crossing, it had matured into a very modern, high speed slab, likely having something to do with its proximity to Lake Sonoma, an Army Corps of Engineers project. For some reason, the speed limit on this section was as low as 25 though even two-up and fully loaded, we were easily managing 55 through the perfectly banked sweepers. This road must be crawling with sport bikers (and hence cops) on weekends. Once back to 101, the rest was a bit of a mind-numbing slog back to the city. Yet, even as we crossed the Golden Gate, just 20 minutes from home, we still felt like we were on an adventure. We pulled into the garage, asses sore from the past hour and a half on the freeway, made arrangements to collect our dog from the dogsitter, and started talking about the next time we could get out on the bike for a weekend. Power inverter instead of DC adapters for everything - We ended up in hotels a couple nights and I really could have used the regular wall warts. Doesn’t make sense to bring both AC and DC. Some kind of camping pillow setup. My neck kills me on those Thermarests.